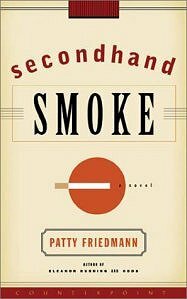 The best description of Secondhand Smoke appeared in Library Journal: they called it “Confederacy of Dunces meets The Corrections.” A dark comedy, this novel places a dysfunctional family into Irish/Italian working-class New Orleans. Somehow it lets a most unlikable old woman and her two unhappy children slug it out and figure it out, then lets us like them all in the end. Jerusha Bailey is toxic: not only does the smoke from her cigarettes probably kill her curmudgeonly husband, her poisonous personality has driven her adult son and daughter as far from her as they can manage. The only person left in her sights is ten-year-old Dustin Puglia, who lives next door with his equally bad mother, sleeparound, neglectful Angela. When Jerusha’s house burns down and Angela pulls a regular disappearing act, Jerusha learns quite a lot about survival from the chubby, streetwise little boy. This is a book about responsibility. Secondhand smoke is just a metaphor: the person puffing away, releasing carcinogens into the air, is harming others far more than she’s harming herself. Or is she? Jerusha’s children, Wilson and Zib, are damaged by the vitriol she spews; at what point do they have to stop blaming her? Readers say they laugh aloud when reading this book. Probably the funniest scene is the one in which Jerusha, on her way to meet Wilson and Zib at Arlington Cemetery for her husband’s funeral, finds his ashes have been stolen in a McDonald’s parking lot. It is possible to read this book just for the humor, but it also raises a lot of serious literary issues. I tell people that when I was younger, I was so shallow that I should have been euthanized. I could form sentences, but I couldn’t think. Not until I was creeping up on 40 did I find my voice. I wrote a paean to failure, a humor book, called Too Smart to Be Rich, my answer to the yuppies. It gave me the entrée into publishing I needed, and since then I’ve been able to write novels that someone would print. My first novel was the requisite roman a clef: The Exact Image of Mother drew on my experience as an educated, middle-class woman (I went to Smith College) who decides to have a child out of wedlock. I did so in 1976, long before it was a movie-star sort of move. My next book, Eleanor Rushing, was a story of erotomania, pure fiction. Odds followed quite quickly, and while it was a product of my imagination, it did spotlight marital abuse. I made the mistake of marrying a very unpleasant man when my daughter was three, but I suppose the pain enriched the prose. I’ve been told that Secondhand Smoke is my breakout book. I hope so. I now have a great husband. He’s a fire captain, so it’s no surprise that smoke and fire and ashes slip into my stories. My books all are character-driven, they all are set in New Orleans, and they all try to limn hilarious pathologies. I am very different from what I was as a young woman: I’ve taken a lot of dares and made a lot of mistakes, and fiction is my vehicle for either vindication or vindictiveness, I’m never sure which!